Great to hang inside a safe or on the wall. Rack measures 6 x 5.25 x 6"
This Boomstick Gun Accessories 3 slot handgun rack is perfect to mount in your safe or to any wall. Sturdy vinyl coated metal means your guns finish is protected while not in use. Each channel is designed to hold most size handguns, even most wide body pistols and magnum caliber revolvers, by simply resting the grip and the trigger guard in the rack. These are perfect to help free up room in your gun safe. Mounting hardware is included (4 Philips head screws and 4 wall anchors). 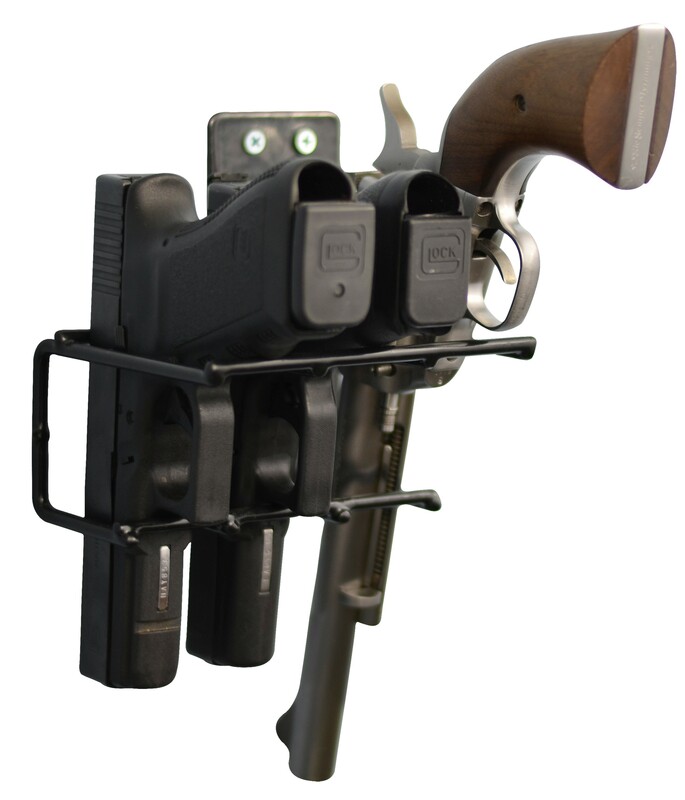 Handgun rack overall length 6 inches, width 5.25 inches, and height 6 inches. Each channel measures 1.6 inches wide and is 3.7 inches deep.